At the beginning of the fall 2018 semester, I spent some time reading the descriptions of all 21 First-Year Learning Communities offered to Wagner’s 425 first-year students. 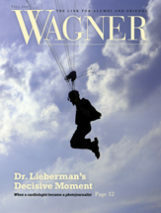 What an interesting slate of topics the Wagner faculty created! I wished I could take all of them. I’m curious about “the nature of science and its relationship to modern life”; I’d like to know more about “how language, culture, social and political events are interrelated,” whether there is “a place for consciousness within an evolutionary account of human beings,” and “the triangular interaction of humans, microbes, and the environment,” just to name a few examples. Professors Alison Smith and Anne Schotter take their First-Year Learning Community students on a visit to Port Richmond, Staten Island, in 2011. As we celebrate the Wagner Plan’s 20th anniversary, I want to recognize that the Wagner Plan works because of the commitment of the faculty. Their enthusiasm for giving students a rich and meaningful education from their first to their last semester has made it successful. First-Year Learning Communities, in particular, require extra time, coordination, and care. The two professors who collaborate on each Learning Community create a theme, teach basic courses in their disciplines around this theme, organize learning opportunities outside of the classroom, offer in-depth writing workshops in the Reflective Tutorial course, and provide academic advising to each student. Their Learning Community’s title has evolved from “City and Civilization” to “Encountering Others in the Old World and New” to this year’s “Exploring the Global Roots of New York City.” It has always incorporated basic courses in literature and history, but with varying emphasis as interests and needs have evolved. The Reflective Tutorial focuses on exploring the history and culture of New York City. Anne Schotter works with her First-Year Learning Community students during a visit to Port Richmond, Staten Island, in 2011. Smith has also worked with economics professor Mary Rose Leacy to teach “Urbanization, Civilization, and Collapse” and with psychology professor Larry Nolan to offer “Citizen Appetites,” which combined historical and psychological perspectives on food. Schotter has also collaborated with Patricia Moynagh (government and politics) to offer “Human Rights and Human Wrongs,” which looked at issues of justice in politics and literature. It takes an unusual degree of dedication to offer a First-Year Learning Community, as well as all other components of the Wagner Plan. 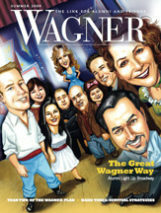 Wagner is indeed fortunate in its faculty and their joy in teaching.